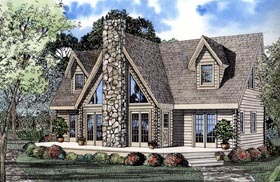 Any mountain or flat land would feel honored to have this gorgeous log home plan placed on it. The central great room separates a master suite from the family area containing the kitchen and dining rooms, giving each area its own privacy. The dining room has French door access to the deck-perfect for grilling and after dinner conversation. The opposite side has the master suite complete with private bathroom and access to the deck as well. A beautiful staircase leads to the upper level bedrooms, each equipped with plenty of closet space and loft area with bathroom and nearby linen closet. Question: Can this house plan be built on an existing a frame house? Im looking to add on to my house and love the house plan. Answer: This is a great design and is engineered for log construction method. You can use this design to tie into an existing structure as long as you have a builder or framer discuss in detail there on your site.